This photo, and your latest one of the road, bring back memories of my childhood. What beautiful pictures! Lake McDonald is my favorite spot on the planet too. We camped there most of my life and my kids know that's where I want my ashes to be someday. 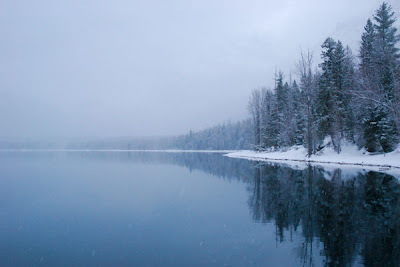 My current story centers around the lake and the healing properties of being there. It's home. The shoreline by the ranger station has the best skipping-rocks in the world. This shot evokes lots of memories for me, too ... not of my childhood, but of the years I worked at Lake McDonald. I worked at the lodge 6 summers, and then had two more years with the Park Service at West Glacier -- great times, all of them. And I've been going back ever since, all seasons and all kinds of weather. Even though those summers were decades ago, more than anywhere else that place is still my home.